Source: Greenwich Graphic. Saturday, March 1, 1890, third page. 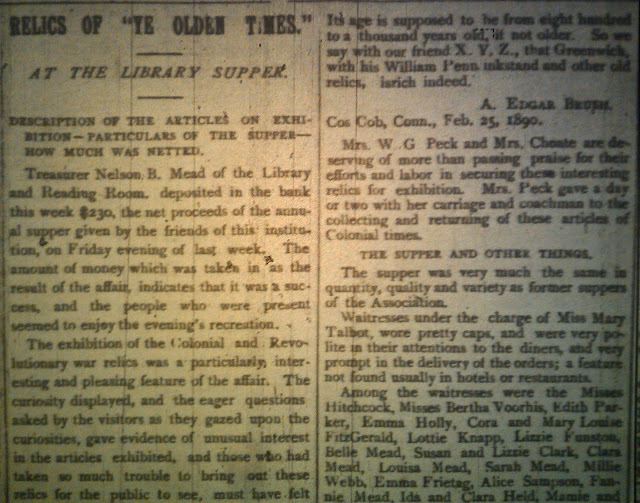 DESCRIPTION OF THE ARTICLE ON EXHIBITION-PARTICULARS OF THE SUPPER-HOW MUCH WAS NETTED. Treasurer Nelson B. Mead of the Library and Reading room, deposited in the bank this week $230, the net proceeds of the annual supper given by the friends of this institution, on Friday evening last week. The amount of money which was taken in as the result of the affair indicates that it was a success, and the people who were present seemed to enjoy the evening's recreation. 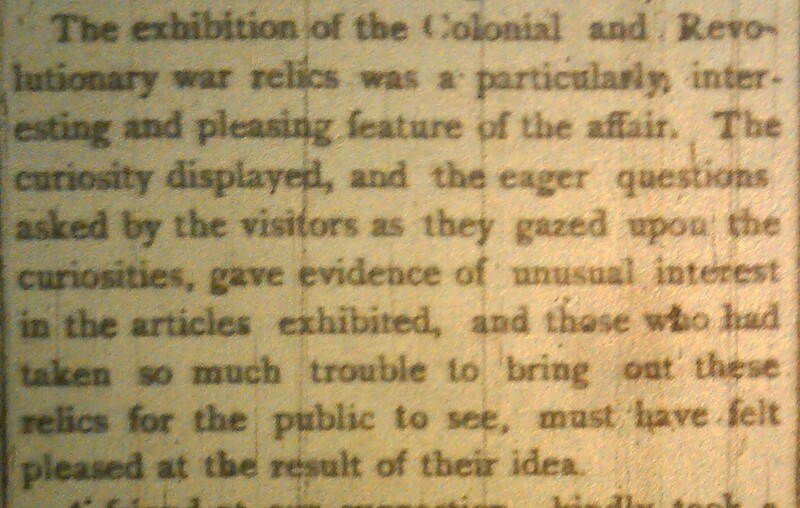 The exhibition of the Colonial and Revolutionary war relics was a particularly interesting and pleasing feature of the affair. 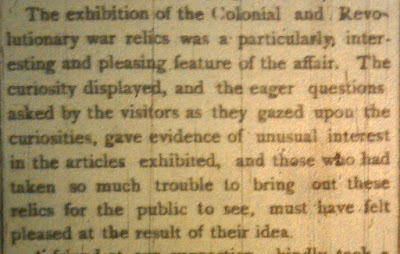 The curiosity displayed, and the eager questions asked by the visitors as they gazed upon the curiosities, gave evidence of unusual interest in the articles exhibited, and those who had taken so much trouble to bring out these relics for the public to see, must have felt pleased at the rest of their idea. A friend at our suggestion, kindly took a photograph of the articles for us, and a very pretty and odd picture was the result. 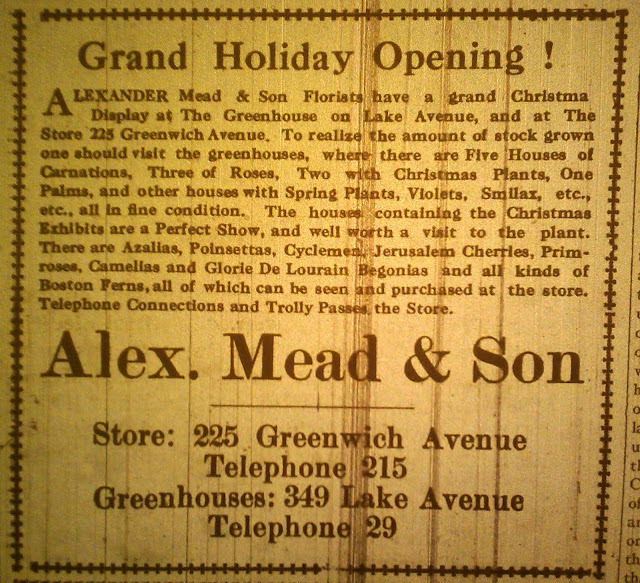 From the photograph we intended to get a newspaper cut made, but the time was too short to enable us to do so, and also because the photo engravers in New York could not guarantee a good representation. The articles comprised: A tall candlestick, tallow dip, 200 years old, owned by Mr. J.G. Clark, Bedford, N.Y.
A pair of curtains bought in England in 1740 at ____ a yard; now the property of Mrs. Jabez Mead. A small flax spinning wheel, brought from the North of Ireland, 150 years old, now in the possession of Mrs. Choate. A chafing glass, once the property of General Putnam, but now owned by Mr. John R. Grigg. A smoked beef cutter, which Gen. Washington used to manipulate, but which now finds a resting place in the home of Mr. Mark Banks. An old candlestick, and a newspaper in mourning for George Washington, and a copy of the New York Morning Post, 1783, and an old fashioned foot stove, were loaned by Miss Amelia Mead. A mortar and pestle, in use before 1750; the sides of the mortar had been chipped; they were used for medicinal purposes during the Revolutionary war. These articles were exhibited by A.A. Rundle. An old-fashioned door latch, made in 1754, taken from a door in the house where Mr. Solomon Mead was born, and owned by Mr. Mead. A sunrise quilt, over 100 years old; an old and remarkable bed quilt; the sun is represented as in the center of the patchwork, shining in all its glory and splendor, and around it are representations of the changes of the moon. This quilt belongs to Mrs. Jabez Mead. A large spinning wheel, and old-fashioned warming pan, a musket, old fashioned chairs, copper coffee pot, and candle sticks, all very old family heirlooms of Mr. D. S. Mead. The oldest relic exhibited belongs to Mr. Jacobs, the artist, and was a Florentine water receptacle; it is shaped like a copper kettle, and was fund in a junk shop in Italy. The age was determined by finding the name Michae coggra pounded into it. Search revealed the fact that this man lived from 1390 to 1480, and the receptacle was probably in use about the year 1470. A solid silver tankard which belonged to the grandfather of Col. Thomas A. Mead. It was hidden for a time during the Revolutuionary war, under a cabbage head in the garden, for fear the Tories might steal it if they saw it, and melt it up for their use. This is now the property of Miss DeMille. Some old china and a 40-shilling note of 1775 were exhibited by Mr. A. Edgar Brush. A flintlock musket, used in the Revolutionary war, now owned by Mr. Zachias [Zaccheus] Mead. A book printed in London during the reign of Queen Anne, 1722, exhibited by Mr. Washington Choate. 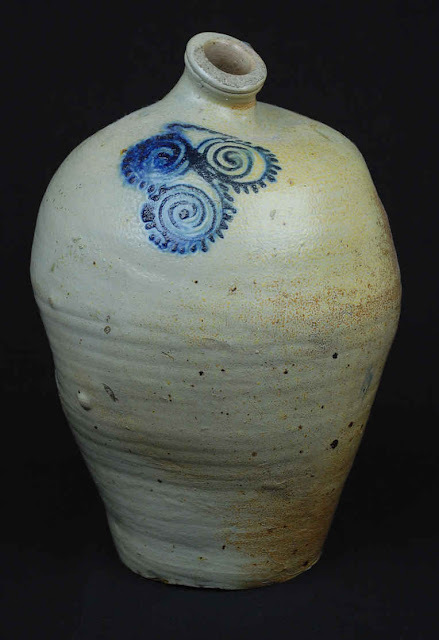 A sample piece of pottery by Deacon Abraham "Potter" Mead. A tortoise shell comb quite old and some pottery made in 1790 and 1791 by Abram Mead, known as "Potter" Mead, great grandfather of Nelson B. Mead, and a soldier in the Revolutionary war. His pottery was situated down near were the Held House now stands, known then as Indian Field. He could not work at his trade during the war, because it excited the anger of the Tories and Cowboys. On several occasions it is related that his wife became so annoyed at the raids of the thieving Tories and Cowboys that she packed up her valuables and intended leaving for the interior, where life and property were more secure. Mr. Abram Mead's staunch patriotism was so well known that these marauders made life uncomfortable for him at times, and he was often in danger. A powder horn once carried by Deacon Abram Mead ("Potter") in the Revolutionary war-and interesting relic-was also on exhibition. Cut in the horns are the words, "Surrendered to the Colonists, Nov. 2, 1775," and it is also covered with carvings of forts and boats and other suggestions of a soldier's fancy of those days. These articles now belong to Mr. Oliver D. Mead. An old German Bible 200 years old, with brass clasps and leather binding, came from J.G. Clark, Bedford N.Y. Some Continental money, the property of Mrs. Haight, Glenville. The Charter of Connecticut, 1750, was exhibited. First coffee imported into the United States, in possession of Miss Palmer. An old spoon with the name Lilla Reynolds engraved on it; now the property of a person of the same name. An old red cloak, the wedding cloak of the grandmother of Nelson B. Mead, in his father's side. First copy of the New York Herald. 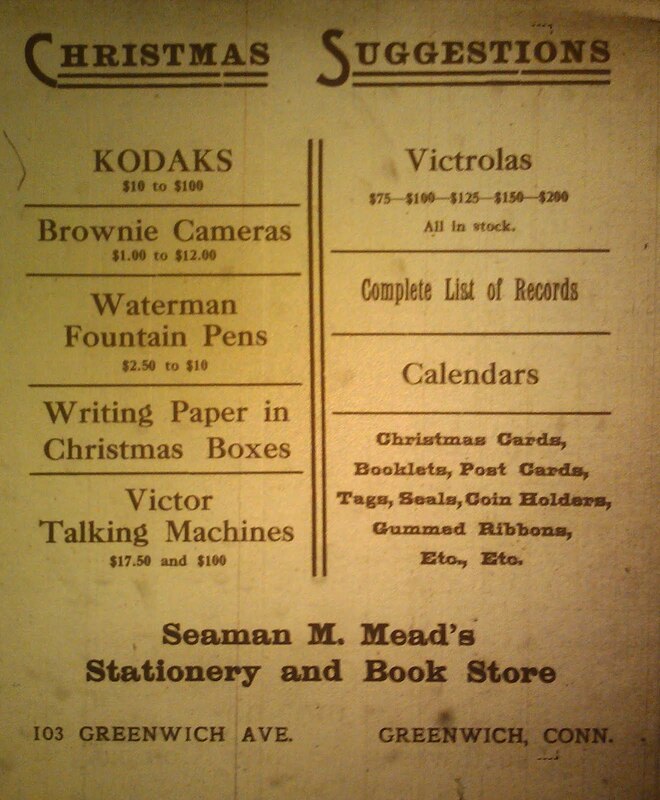 First and only copy issued of a paper called the Greenwich News, dated 1854. The New York Gazette 1812. These articles are owned by the Library and Reading Room Association. Some old china, pieces of helmet, now very rare in the United States; was given to Mr. Nelson B. Mead's grandmother by an old sailor whom she took care of while sick, his vessel making this port. This sailor brought the china from China, and he valued it very highly. Also some pottery made by Deacon Abram Mead ("Potter Mead") at his pottery in Indian Field; a child's dress100 years old; cotton, imported from England; an old chair given by Deacon Abram Mead to his grandson, Augustus Mead and a son of Nelson B. Mead. All the above articles are the property of Nelson B. Mead. The piece of pottery when in its perfect state, judging from the circle of the relic found must have been between three and four feet in diameter, and depth four to five. This by the Indians was used as a burial urn, the body being laid in a curved position and the rest of the space being filled with the belongings of the person so buried. Whether this urn was used for this purpose, we are unable to say, as only part of the relic was unearthed; but we are led to believe that had the digging gone on, the rest of the urn would have been discovered, and the relics of the person found. The clay used is of a brown that on the edge, shading on a slate color, caused by the intense heat of baking. The clay is filled with dust of, or ground mica, and all from our Greenwich clay. Around the top and side, extending a few inches, is a curious archaic Greek border, done with a stick or stone, making a handsome though quaint design. Many such relics have been found in Georgia and other places; but this one is the largest ever found in the New England States. Its age is supposed to be from eight hundred to a thousand years old, if not older. So we say with our friend X.Y.Z., that Greenwich, with his William Penn inkstand and other old relics, is rich indeed. 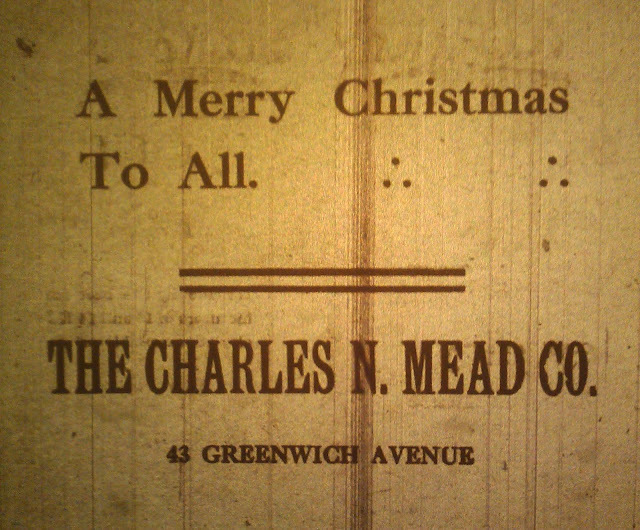 Cos Cob, Conn, Feb. 25, 1890. Mrs. W.G. Peck and Mrs. Choate are deserving of more than passing praise or their efforts and labor in securing these interesting relics for exhibition. Mrs. peck gave a day or two with her carriage and coachman to the collecting and returning of these articles of Colonial times. The supper was very much the same in quantity, quality and gaiety as former suppers of the Association. Waitresses under the charge of Miss Mary Talbot, wore pretty caps, and were very polite in their attentions to the diners, and very prompt in the delivery of the orders; a feature not found usually in hotels and restaurants. Among the waitresses were the Misses Hitchcock, Misses Bertha Voorhis, Edith Parker, Emma Holly, Cora and Mary Louise FitzGerald, Lottie Knapp, Lizzie Funston, Belle Mead, Susan and Lizzie Clark, Clara Mead, Louisa Mead, Sarah Mead, Millie Webb, Emma Frietag, Alice Sampson, Fannie Mead, Isa and Clara Held, Mamie and Gracie Child, Elsie Strong, Mamie Brush, Lottie Lockhart, and a number of others. Miss Young's "Literary Salad" proved a very taking dish, for it was something new, instructive and very pleasing to literary tastes. Quite a sum was netted by Miss Young's idea. The fancy table was well patronized; on it were displayed many pretty and costly articles which had been donated by the King's Daughters and lady friends of the Library and Reading Room. Mrs. Seleninoff, Miss Julie Peck, Miss Belle Hoyt, Miss Nellie Mead (North street) and Mrs. Brush were in charge of this table. The home-made candy table was not by any means deserted, and Miss Blanche Ray and a friend gave good measure and pleasant smiles to all who brought this excellent article. Miss Bell and Miss Katie M. Mead were the cashiers, and could have readily handled double the amount of money which came in from various sources. 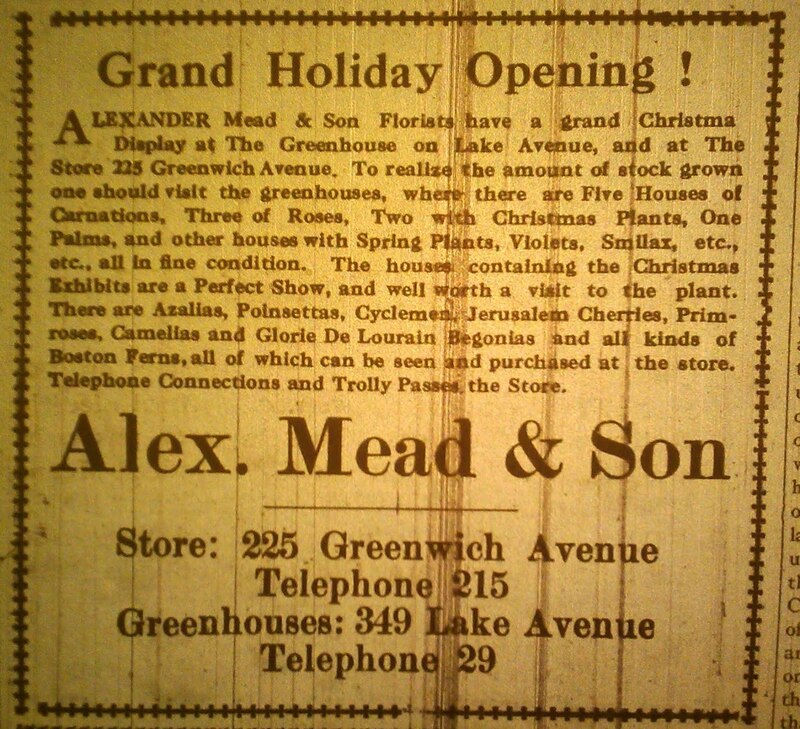 Amos H. Mead dealt out the ice cream, and Henry M. Brush took the tickets at the door. The relic feature seemed to take so well, that it has been proposed to have an exhibition for a week next summer, and to get everybody to loan articles of this kind, that they may have. A small admission fee will be charged, and the receipts will go [to] the Library and Reading Room. There is little doubt but that a very large collection of relics could be obtained, and the Exhibition would prove a popular place for the summer visitors, as well as to most of the residents of Greenwich.